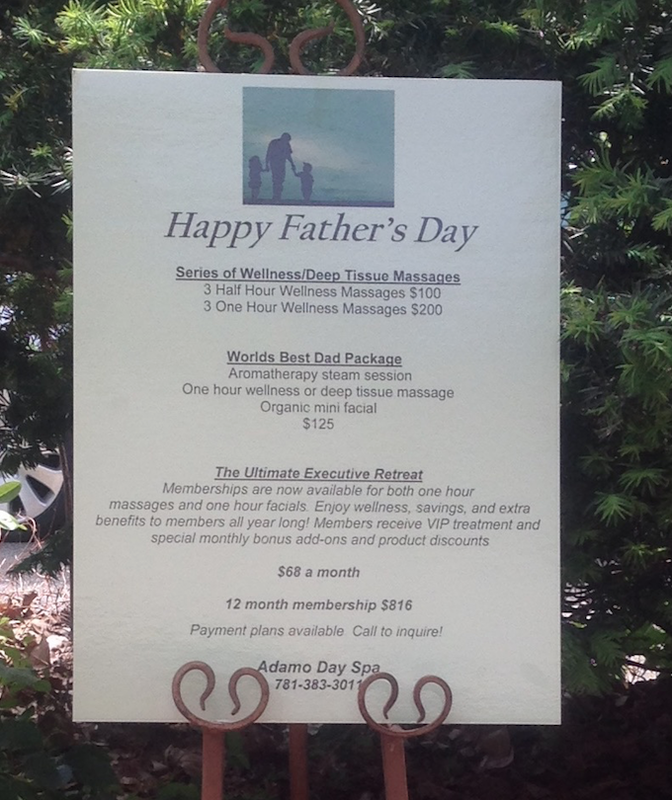 Father’s Day is this weekend and Adamo Day Spa has everything you need to take care of the special men in your life. Men often forget about skincare and nourishing the skin on their bodies. We’ve all been kissed by too much scruff, or sat uncomfortably in a beach chair next to a man with just a little bit too much hair for baring… Don’t sweat it ladies, give them a gift certificate to Adamo. We have a line of specialized treatments designed just for men. Everybody deserves to look and feel their best. Mens skin specifically, takes a beating daily. They shave, slap some alcohol after shave on their face, ignoring the rest of the body and walk out the door. Most men are not taught how to take care of their skin, and they certainly don’t want a fussy regimen like women are willing to stick to! Help those awesome Dads, brothers and uncles in your life, feel and look their best. Send them in for a Gentleman’s Facial or a Deep body cleansing Back Facial treatment. Men may not feel comfortable saying they need some good old fashioned grooming at the spa, make it easy ~ by suggesting it. Let’s face it everybody feels more confident with healthy glowing skin and the attention of a trained therapist that will send you out the door relaxed, exfoliated and energized. How about a pedicure for rough heels and tired feet or a deep tissue body massage to work out the kinks, I already mentioned all of the extra hair…how about a back wax honey? You get the picture. Order your Gift Certificates now and get those hard working and loving Dad’s all spiffed up, we all love a happy Dad! Think about that one ladies. Don’t forget Adamo VIP members always get extra perks and discounts on products and services. Ask about membership when you call, that’s always the perfect gift for you or a loved one.